Allie Webb daughter of William Webb and Olive Baker. b. November 04, 1882 Moline Kansas, Elk County. d. September 21, 1971 Cushing, Oklahoma buried Fairlawn Cemetery Cushing Oklahoma. Died of cancer. Married Doug Burke May 05, 1901 Payne County Ok.
Child 1 Viola Burke (War then): Birth Jan. 15, 1902 Clayton Township Death July 26, 1972. She has a child Curtis Warthen. Child 3 Beulah Burke (Hammon): Birth Dec. 3 1904-1905 Perkins, Ok. Death Nov. 27, 1970. Child 4 Elsie Burke (Peet): Birth Sept. 19 1908 Perry, Ok. Death Oct. 13 1985. 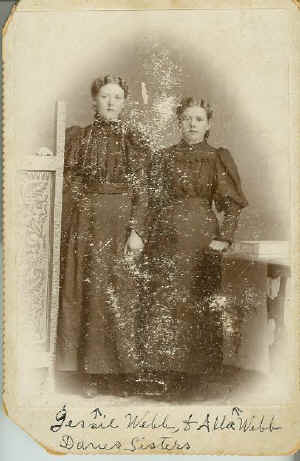 Elsie and Opal Cheesman were great friends. Child 5 Charles Lee Burke: Birth April 9, 1911 Perry Ok. Death Dec. 1 1996 married Opal Paris Cheesman. 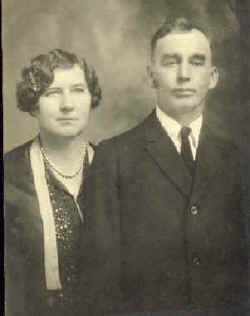 They had 2 children Charles Leon Burke, Deloris Jeanne Burke (Ryan). Child 8 Bobby Burke: Born Jan 24,1950 Cushing Ok. Death Aug. 19, 1982 in Oklahoma City, was in the U.S. Army Stationed in Austria. Later was a florist in Perkins. Married Ilene Pendegraff of Edmond Ok.
On the back of the following attached photo, my grandmother Webb has written the following message: "Alla died one or 2 years after George Webb died. My grandmother Opal Paris Cheeseman Burke told me that Allie was very sweet. She was loved and admired for raising all the children after she and Doug divorced. Allie worked at a pie shop to support her family. Allie died of cancer and it was told that she didn't have a line on her face.